Was Weege Really A Flagger At Englishtown? Phil Nicoletti and Racer X’s Jason Weigandt were co-hosts on Steve Matthes’ PulpMX Show last night. Around an hour or so into the show, Phil, a native New Yorker, brought up an interesting topic that has apparently been circulating around the New Jersey/New York moto scene: Was Jason Weigandt REALLY a flagger at Englishtown New Jersey's Raceway Park growing up? First, some backstory. If you listen to Pulp or DMXS or one of the other 1000 podcasts out there, you know Weege’s (supposed) backstory. He grew up a huge fan of moto. He rode quads. He "apparently" flagged at Englishtown. He got a job at Racer Productions (sister company of Racer X). Began announcing and now is the editorial director at Racer X and announcer for Lucas Oil Pro Motocross, American Flat Track, GNCC, Geneva, Red Bull Straight Rhythm, and more. That’s the condensed version of his career. Back to the show last night. Here is the condensed transcribed version of the conversation between Phil, Weege, Steve, and Nash, a regular on the PulpMX Show and a New Jersey resident, or you can listen to it here around the 1hr 48min mark. Matthes: Okay, so Nash, we’ll wait for Phil here but I’ll kind of lead into the story. So Weigandt, as you know, flagged at Englishtown, right? Weigandt: There is no debate here. Matthes: He was with Ultimate, everything else. Ultimate was the ultimate flagger, Weege got a job flagging, everything else, so this has just been part of Weege’s story, and we all love him for it, right? Matthes: Phil, who was a town regular, says that… Phil, you say you and all of your buddies never saw or heard about Weigandt flagging? Nash: Well, Weigandt was there in the mid-90s. Don’t taze me, bro. Matthes: His buddies are that old, right? Phil: Yeah yeah, they’re all there. They were all there. Weigandt: Which one of you people in this building or listening to this show ever introduced yourself and hungout and spoke to a flagger? Nash: J-Law would taunt the flaggers. Phil: Yeah, [laughs] exactly, that’s about it. Weigandt: So everyone’s like: “We never talked to this guy and he was a flagger?” Of course you did not talk to me, because I was a flagger! Weigandt: Why would they come and talk to me? Matthes: I mean they seem to know everybody. Phil: Yeah, they know everybody. Phil: Yeah, they don’t know. Weigandt, naw, he was never a flagger. Weigandt: Why would they have spoken to me? 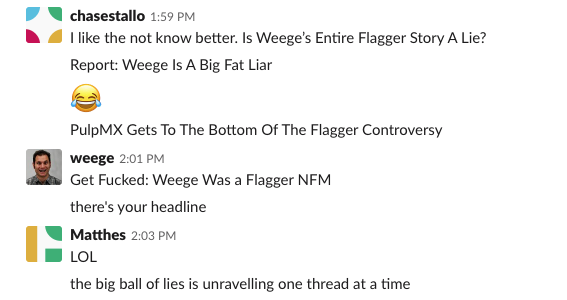 Phil: There is no evidence of Weege being a flagger. Yeah, Zubko, yeah, Richie doesn’t know who Weege is. Yeah, Richie Zubko, Englishtown legend. Matthes: Are you making this story up? Nash: He is not making it up. Weigandt: I want you to think back to all the local tracks you guys grew up racing on and name me all the other flaggers that you remember. Weigandt: I was just one of all the flaggers who aren’t known. Weigandt: I could not believe they were going to pay me $40 a day to watch the races. I could not believe it. Phil: After he was already paying to be a spectator. Weigandt: Yeah, I used to pay the whatever it cost to sit in the bleachers and watch. Matthes: But you did say that Kessler talked to you sometimes. Matthes: But Phil, your buddies, no body heard of him, nobody knows? Phil: Nope. They think Weege is a full-blown, like yeah, he’s a scam. Nash: You know who could settle this and be a third-party person that could…. Matthes: Ultimate. Could we get Ultimate on the line? Weigandt: How would I know that we had a flagger named Ultimate? How would I have this knowledge? Matthes: No, because Lukaitis knew about Ultimate. Weigandt: Who told Lukaitis to look for a guy named Ultimate? Phil: Does Lukaitis know that you’re a flagger? Weigandt: No, but why would he? Actually, I think I can get verification, Lukaitis would know some of the other photographers that I did know, Frank Visone, and there was one other guy. Phil: Listen, if Thom Veety doesn’t have a picture of you somewhere along the lines, it’s over. Weigandt: Oh yeah. I'm sure he takes a lot of pictures of flaggers. Nash: Thom Veety definitely has photographic evidence. Nash: Couldn’t we verify? Richie could verify. Phil: No, he paid Weege and he still doesn’t know. Weigandt: No, I got paid by Kenny Landerman. Matthes: So wait, we had someone who would pay the flaggers and not know who Weege is? Weigandt: He didn’t pay flaggers, he announced, and I got paid by Ken Landerman, he would give me my $40, my two $20 bills. Phil: You never talked to Rich Trevelise? Matthes: Nash, can you do us a favor and try to get to the bottom of this for us? Nash: I will be satellite reporter for PulpMX. Trevelise could definitely talk to Landerman and we could search through files. Matthes: Yeah, can we get Landerman on the show to talk. Weigandt: Is Landerman still around? Nash: I’m sure all the people at E-Town could get a hold of him. SOME NEWS BROKE WE CAN’T SHOW. Sorry not sorry. Weege then reached out to Scott Lukaitis via email! Lukaitis confirmed he had ZERO photographic evidence of Weege flagging at Englishtown. Turns out it was fake. 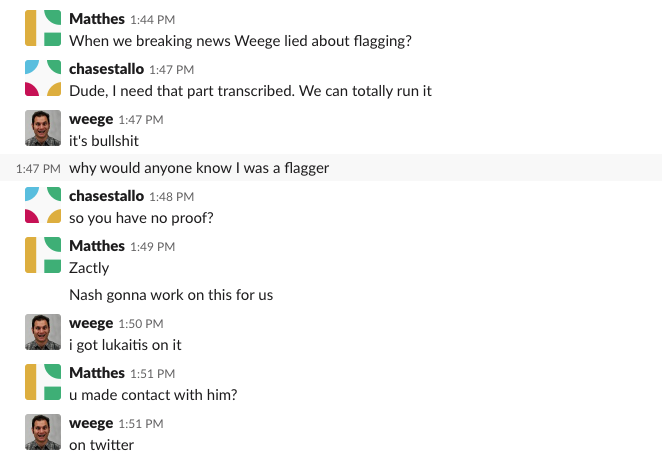 So, here we are, nearly 24 hours later and we have ZERO proof if Weege was a flagger or not.